Where to begin, that is the question? Lately, it seems, I ask myself that question most every morning. This cold wintry morning, with January temperatures a full month early, (27 degrees an hour before sunrise with an uncomfortable breeze) kicked off with a flurry of email correspondence that required immediate attention (more on this in a bit) and then an interesting and informative Kingman Visitor Center board of directors meeting that included presentation of my report on the trip to Edwardville and the Miles of Possibilities Conference. On the heels of that meeting I met with the organizers behind the Best of the West on 66 Festival to discuss their selection of inductees into the Route 66 Walk of Fame in 2016. That was followed by a brief meeting with Josh Noble, the tourism director, and some of the staff at the Ramada Kingman, and then a stop by the new office in the historic Dunton Motors building next to Mr. D’z Route 66 Diner to unload a few more items. I now have a place to hang the hat, meet with visitors to the Kingman area, sign a few books, answer questions, and tell people where to go. I won’t be keeping regular business hours so it is best to call or email and set up an appointment, or stop by, try your luck, and ask Garth if he can find me. 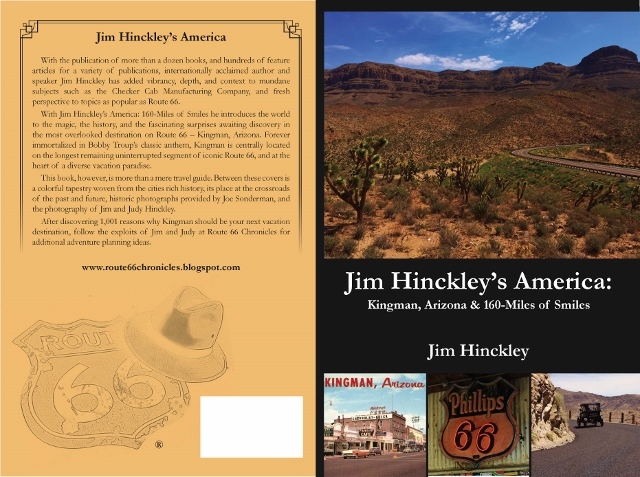 Then, after a brief lunch, I again tackled the submission of the guide book to the Kingman area, my first self published endeavor, in an ebook format. Once again I am setting my sights on Friday to have this complete and ready for purchase. Please note, I haven’t figured out how to autograph an ebook. I would be quite remiss if it were not noted that the print version of this guide book is available on Amazon.com in the United States as well as in the U.K. Here is the link for Amazon.com stateside. As Mr. Keppel handled the file format issues with the print copy as well as the ebook, I would have to say that he has been a true blessing with this whole endeavor. Incredibly, in recent email correspondence it was noted that he was eager to get started on the next project. I have a few ideas on what follows next as this was only volume one in the Jim HInckley’s America series. However, first I do need to finish the book on the Route 66 renaissance (your comments and thoughts on this storied road and its future would be most appreciated). As envisioned the second volume will focus on a few of our favorite drives in Arizona, and the California desert. Obviously this will be a larger project than the sixty-five pages of the test subject; Kingman Arizona and 160 Miles of Smiles. As income that allows eating on a regular basis is a prerequisite, I might need to shelve this idea for just a bit. Aside from the book on the renaissance, I have two completed manuscripts, aside from final editing, layout, and photo correlation that were approved by publishers, submitted, and then dropped resultant of mergers or corporate restructuring. One of these, Bathtubs, Birdcages, and Chevrolet would be a bit of an endeavor as that submission was made in the late 1990’s. So, as it is on paper and the photos are transparencies, I would need to retype it and scan the photos. I really can’t tell you why this was shelved instead of marketed after it was returned by the publisher. As I recall this was during the period that I received a steady stream of assignments from various magazines followed by a major book deal (The Big Book of Car Culture). I think the book would be of interest to auto enthusiasts as well as to those individuals who have as much interest in automobiles as frogs do with tap dancing. After all, who isn’t intrigued by the story of Henry Ford’s role in the founding of Cadillac, the Dodge brothers contributions to the creation and development of Ford and Oldsmobile, or the fact that Chevrolet began as an import. The problem is that it could take as long as six months to rewrite the book, make corrections and updates, and scan images. The taxi book would go much smoother as all that is needed is final edit, photo correlation, and transference to the correct template. 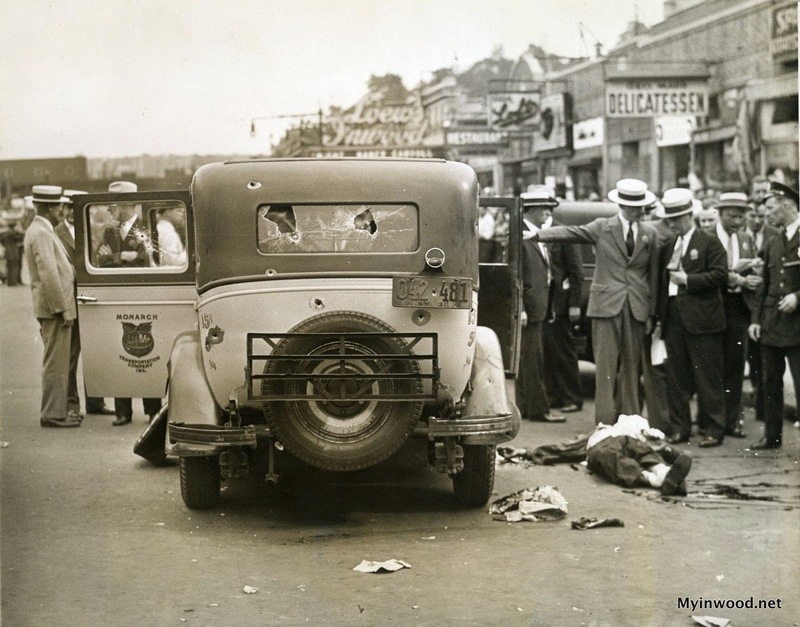 However, even though I found the research that went into the book quite interesting, I am not sure how much of a market there is for a book that chronicles the violent evolution of the American taxi industry. Also lurking in the wings is that joint project with Kerrick James, the photographer we partnered with on Ghost Towns of Route 66. This would be a book on adventures in New Mexico. There is also that pesky pod cast that has been simmering on the back burner since at least May. Sometimes all of this is just to much to think about so, instead, I turn thoughts toward good food shared with friends. 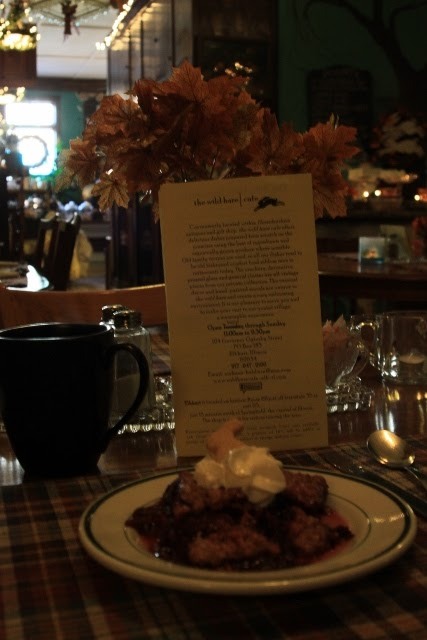 With that said, here is this weeks restaurant recommendation; the Wild Hare Cafe in Elkhart, Illinois. 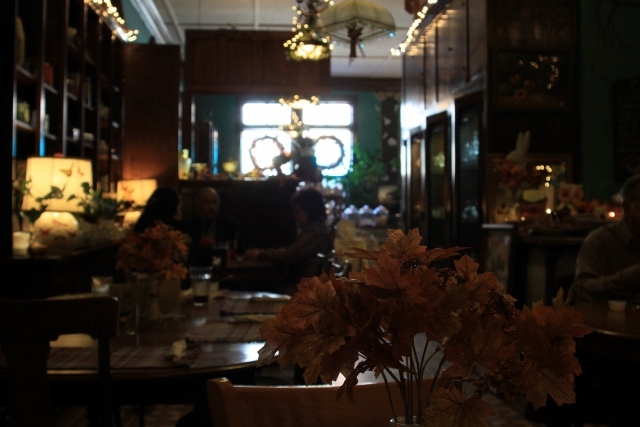 Superb food at a reasonable price, amicable and interesting proprietors, and a very unique ambiance make this little gem tough to beat. Now, let me share a bit of news from Kingman. To the best of my ability I will avoid ranting or prejudicial comments. I also ask that if you have thoughts on this issue, please do a bit of homework and then respectively share them with Kingman city government officials or as a letter to the editor at the Kingman Daily Miner. The homework can start with this article. In a nut shell, the previous eighteen months have resulted in a dramatic change within the cities historic district. In fact, more has been accomplished in this period than during the previous eighteen years. I personally attribute this to three primary factors; a city government that provides leadership in regard to revitalization, the fostering of cooperative partnership development by organizations such as the Route 66 Association of Kingman, and the revitalization of one primary block that is dominated by the massive historic Central Commercial Building. Here is the link for the Google street view, the Central Commercial Building has the red brick second story with awnings, the church is looking to lease the cream and white section in mid block. When I first moved to Kingman, Valley National Bank was the most recent tenant on the corner and the rest of the store was one of those places where you could buy fresh cut meat, car parts, jeans, saddles, a couch, or a rifle. Now, the building has been cut up into storefronts with the main vaulted area that has a sweeping stairway and a mezzanine lined with windows being set aside for an event center. For those familiar with Kingman, this is the building that houses the art hub, the Cellar Door, and Redneck’s Southern Pit Barbecue one block off of Andy Devine Avenue, Route 66. A mega church from Las Vegas has set their sites on the event center for their “Kingman campus” with the owners blessing and a small herd of attorneys hovering in the background to intimidate opposition with thinly veiled threats that center on the restriction of religious liberties. It should be noted that the building was renovated with various grants associated with historic preservation. It should also be noted that for reasons unknown, the owners have done little to find a tenant for the central “auditorium” in the building. In fact they declined the offer to rent the facility during the 2014 Route 66 International Festival. First, I am a strong supporter of churches even though it is difficult to view the modern American corporate version that is based more on the Walmart model for success than the one mandated by the disciples in the book of Acts as a church. My opposition in this instance is based on the simple fact that this is not a proper location for a church, this is a commercial district that is struggling to make a comeback. A five year lease on this property could adversely impact the economic revitalization of this district. Numerous facets of the churches operation will impede festival and event development and place legal restrictions on the type of businesses that can open in the immediate area. Even worse, the battle that has ensued has created divisions and threatens some of the fragile cooperative partnerships that were recently established. At this juncture the city is limited in what they can do. However, public input can limit or prohibit the issuance of the conditional use permit and the zoning change needed for the church to utilize the property. That is the latest adventure in Kingman. at the end of the post I will include a letter from the Kingman Downtown Merchants Association. Now, the last item of the day, emails. As noted I am working on a new book about the highways renaissance. Your input would be appreciated. What are your thoughts on the revival? Who do you think I should profile? I hope that everybody had a great Thanksgiving Day Celebration. As you may know there is a special meeting scheduled with the Central Christian Church this Wednesday at 5:30 at The Garlic Clove. This meeting was originally set to be held at the Central Commercial Building but, at the last minute Josh Ott declined the use, stating that the venue had been setup and cleaned for an upcoming event. The purpose of the meeting is to try and come to some sort of agreement whereas, the downtown merchants and concerned citizens in the downtown area may find common ground and accept the church’s request for a zoning change enabling the church to rezone the venue and use it for assemblies and church services. I have invited the attorneys representing the church to answer questions and provide any additional information we may need. The fact of the matter is that we have already voiced our opposition to the CUP. However, the Kingman Planning and Zoning Commission elected to dump this task back on to the Kingman Downtown Merchants Association to try and rectify this issue so they may skirt their responsibility. The KDMA is hosting this meeting and is not in favor of the CUP in general as a unit. That does not mean that your voice individually, if in favor of the CUP, is not welcomed. We are an association comprised of YOU and concerned business leaders throughout the city. Your voice is critical! Whether for or against the CUP this is your opportunity to voice your concerns and support for or against this issue. As an association we need to lead in the issues that effect downtown Kingman! Whether you are for or against this issue, or any other particular issue, we are an association of hard working business leaders that strive to make our downtown area the best that it can be. We need to stay united and dedicated to the issues that matter and put petty differences aside in order to project and reflect the voices and concerns of everyone in the downtown district. If you have received this email and have noticed that I have perhaps missed someone in the email list please feel free to forward this request to gather this Wednesday to anyone that may have a question or comment. You are a member of a very committed association, at a unique time to cause changes in our city government that is of benefit to all of downtown Kingman. I hope to see you Wednesday, December 2 at 5:30 at the Garlic Clove.